PITTSBURGH — In the hours leading up to Thursday night’s game, Clint Hurdle would not commit to how he thought 38-year-old right-hander A.J. Burnett would respond in his first start since spending six weeks on the disabled list. It turned out Hurdle wouldn’t have been wrong whether he said he thought Burnett would pitch poorly or well. The 17-year veteran did a bit on both while pitching five innings and not factoring in the decision of a game the Pirates lost to the Milwaukee Brewers 6-4 in 13 innings at PNC Park. Out since July 31 with a strained a strained flexor tendon in his right elbow, Burnett allowed each of the Brewers’ first five hitters hit the ball hard as Milwaukee built a quick 3-0 lead. Scooter Gennett ripped a double into the right-center field gap and scored on consecutive sharply hit ground outs to second base by Elian Herrera and Ryan Braun. Adam Lind lined a single up the middle and Khris Davis followed by belting a two-run home run that landed inches short of the batter’s eye in straightaway center field. Then everything changed as the Brewers did not get another run or hit until Burnett exited for a pinch hitter in the bottom of the fifth inning. He retired 13 of the last 14 batters he faced to finish with a line of five innings, three hits, three runs, two walks and three strikeouts while throwing 64 pitches. While Burnett’s outing gave the Pirates hope he could help them through the remainder of the pennant race and into the postseason, especially after he went 1-2 with a 10.13 ERA in three starts after the All-Star break being going on the DL, he was less than thrilled. Not surprisingly, Burnett brushed aside a question about nerves affective his first inning. Though the Pirates eventually dug out of the hole that Burnett put them in, they missed a chance to gain ground in the National League Central. They remained 4 ½ games behind the first-place Cardinals, who lost 11-0 to the Reds at Cincinnati. The Pirates also had their lead for the first NL wild card cut to 2 1/2 games over the Chicago Cubs, who were rained out against the Phillies at Philadelphia. The Pirates realize that Burnett isn’t likely to pitch like he did in the first half when he went 7-3 with a 2.11 ERA in 18 starts while getting selected to the All-Star Game for the first time in his 17-year career. However, Hurdle was still encouraged by Burnett’s outing despite losing to the Brewers — who are 26 ½ games behind the Cardinals in the division standings — for the seventh consecutive time. –Right fielder Gregory Polanco cost the Pirates a run in the bottom of the seventh inning because of a lack of awareness. The Pirates had just gotten within 3-2 when pinch hitter Travis Snider drew a bases-loaded walk from Jeremy Jeffress with two outs. Brewers manager Craig Counsell brought in left-handed reliever Will Smith to face the left-handed hitting Polanco, who swung at strike three. However, the ball bounced off catcher Martin Maldonado and rolled all the way to the on deck circle in front of the Brewers’ dugout on the first-base side. Polanco could have easily reached first base to force in a run but did not leave the batter’s box until Maldonado had already corralled the errant pitch. –Right-hander Radhames Liz took the first loss by a Pirates’ reliever since June 25, a span of 19 decisions. Liz allowed three runs, four hits and four walks in two innings. Bruan hit an RBI single off Liz in the top of the 12th inning to put the Brewers ahead 4-3 but Polanco tied it with a solo homer in the bottom half off closer Francisco Rodriguez. However, Logan Schafer and Luis Sardinas had back-to-back run-scoring singles in the 13th with two outs to give Milwaukee the win. 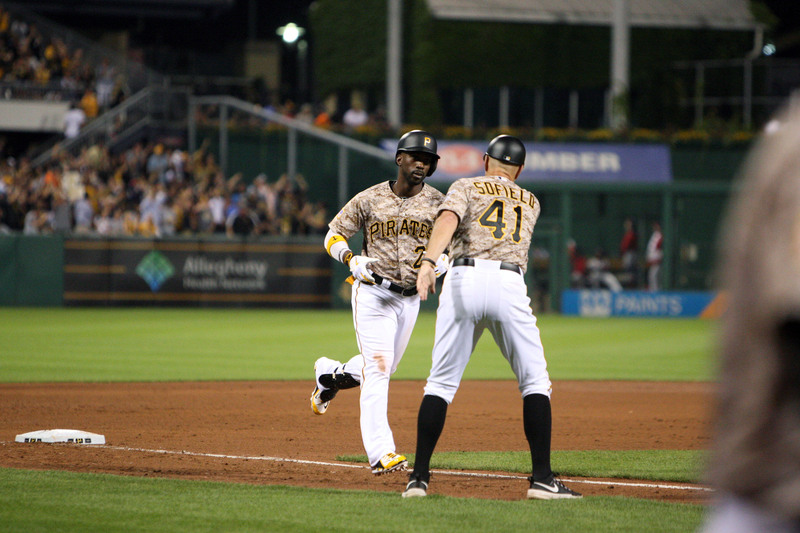 –Left fielder Starling Marte was removed in the top of the 10th inning because of discomfort in his left shoulder. He was hit by a pitch in the eighth inning from rookie reliever Corey Knebel. Marte is listed as day-to-day. –Second baseman Neil Walker did not start even though he came into the game hitting .286 in September. He hit a sacrifice fly in the fifth inning as a pinch hitter on his 30th birthday. Josh Harrison started at second base because Hurdle said he wanted “a better lateral defender” with Burnett pitching. –Rookie infielder Jung Ho Kang started at third base in place of Aramis Ramirez because Hurdle wanted to go with a hot bat. Kang had homered in each of the previous two games, including his first career grand slam Wednesday night at Cincinnati. He went 2-for-6 on Thursday and is 5-for-15 in his last three games. –Center fielder Andrew McCutchen hit his 22nd home run of the season in the eighth inning off Knebel to tie the score at 3-3. It was the seven-year veteran’s 150th career home run, enabling him to join Barry Bonds as the only two players in Pirates’ history with 150 homers and 150 stolen bases. McCutchen also hit a game-tying home run in the eighth inning or later for the eighth time in his career, three of which have come this season.